Home › College Tuition › $100,000 Income? That’s just the new middle class. $100,000 Income? That’s just the new middle class. The following article by Craig Guillot drives the point home…that $100,000 just isn’t going to cut it anymore. In the 80’s when I was in High School, $100,000 in annual earnings meant you’d have more than you ever needed. In just 34 years, thanks to our Government and The Fed, their inflation taxation means you now need to earn $287,000 in today’s dollars to hit that $100,000 milestone of achievement. And it’s only getting worse with no end in sight. This is what slowly turns the press and squeezes the standard of living down and out of the middle class. We cut back on cable and extraneous services. Less car washes. Off-brand food and dry goods. Cheaper gas. Cheaper cars. Fewer home repairs and upgrades. Less vacation. More work. Tighten. Tighten. Tighten. 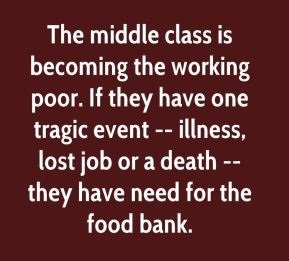 And then you become just the working class, hand to mouth, check to check, dependent on Government for your retirement, your healthcare, your kids tuition, your hard times, and why? Because the Government makes sure you don’t have a penny left over to save for yourself so you can pay for those things on your own. You are infantilized. The Government treats you as too ignorant, too incapable of appropriately caring for yourself or your children, and as a result, they will be happy to assume control of the bulk of your earnings and redistribute them as they see fit. “From each according to his ability, to each according to his need,” is the new American Dream. Never forget who owns you. There’s something about the figure “$100,000” that just has a magical ring to it. Since the 1980s, a $100,000 income has been a benchmark of financial success. It used to buy a nice house in a posh neighborhood, two cars in the driveway, family vacations, college tuition for the kids and a fair level of luxuries. Only about 20 percent of American households even break the six-figure mark, according to Census Bureau data. But while many Americans still see that number as a prized income, it doesn’t necessarily roll out the red carpet anymore. Due to the rising costs of food, energy, college tuition, health insurance and the growing “necessities” of a middle-class life, a $100,000 salary in some parts of the country covers little more than the essentials. A six-figure salary is still a great income, but the quality of life it provides is highly dependent on geography, family size and lifestyle. Making a six-figure salary as a single person in Houston is drastically different from raising a family of four on $100,000 in Boston. Here are five reasons why that prized income no longer buys the high-end lifestyle it once did. The latest annual inflation rate is 1.3 percent. It was 1.5 percent in 2013, according to the Bureau of Labor Statistics. That’s well below average, but gas, food prices, college tuition and the cost of health care have taken the biggest bites out of six-figure incomes. The latter two, plus the cost of housing, have risen faster than the rate of inflation over the past decade. “Everyone spent money on these things 30 years ago, but they’re spending a higher percentage of their income on it now, especially housing, health care and tuition,” says Mari Adam of Adam Financial Associates in Boca Raton, Florida. While the cost of everything has gone up, Americans still equate the six-figure milestone to wealth and prosperity. But according to the Bureau of Labor Statistics inflation calculator, for a person to have the same purchasing power in 2014 as a $100,000 income earner in 1980 did, he or she would need to earn nearly $287,000. While inflation is a real factor in any economic environment, it has been a bigger problem in recent years because wages have not kept up. According to the BLS, real average hourly earnings increased by a seasonally adjusted 0.8 percent from November 2013 to November 2014. That’s not even enough to keep up with the meager uptick in inflation. “We haven’t had real wage growth, and with inflation, Americans are not making much more than they were 20 years ago. Some may even be making less,” says Adam. According to 2013 data from the U.S. Census Bureau, only 22 percent of households had an income of $100,000 or more. Adam Koos of Libertas Wealth Management Group near Columbus, Ohio, says members of most households would see a boost in their quality of life by hitting the six-figure benchmark, but they might be surprised to see it doesn’t necessarily make them high rollers. When the term started being thrown around in the ’80s, a $100,000 earner might have lived in an elaborate home with a BMW in the driveway. Nowadays, he or she is more likely to live in a 1,500-square-foot house and drive a 7-year-old Toyota. “Back in the ’80s when we were kids, we all looked up to a six-figure income and thought it was huge. People still look up to that and think they’re going to be ‘rich,’ but it’s just not the case,” says Koos. Where a person lives has a tremendous impact on how far a $100,000 income will go. Living on that salary in Texas or Mississippi is dramatically different from living on it in New York or Boston. Roy Laux, president of Synergy Financial Services in McKeesport, Pennsylvania, says it’s an unavoidable factor that the cost of one’s mortgage or rent can make or break that six-figure income. “Geography is huge. If you’re in an area where housing has been historically high, it’s just going to take a large portion of that income,” says Laux. The Cost of Living Index compares the cost of housing, utilities, grocery items, transportation, health care and miscellaneous goods. According to Bankrate’s cost-of-living comparison calculator, you’d need to earn about $141,000 in Boston to have the equivalent of $100,000 in Houston. And if you were living on $100,000 per year in Memphis, Tennessee, you’d have to earn roughly a whopping $245,000 to maintain the same standard of living in parts of New York City. While salaries are often higher in cities with higher costs of living, they don’t always match up to provide the same quality of life. “When you live in these high-cost metro areas, it just gets increasingly difficult to do with any income. When more of your money is going to housing, you’ve got less left over for savings and other expenses,” says Adam. Household size and the number of children in the home also have a large impact on the power of a $100,000 income. According to the U.S. Department of Agriculture, the cost to raise a child from birth to age 18 for a middle-income, two-parent family is $245,340. That doesn’t include the cost of college. In recent years, college tuition costs, which have been growing faster than the rate of inflation for more than two decades, have slowed a bit. According to the College Board’s annual Trends in College Pricing report from 2014, the average cost of in-state tuition and fees at a four-year public university increased by 2.9 percent between the 2013-2014 school year and the 2014-2015 school year to $9,139. The past two school years were the first since 1974-1975 in which increases were less than 3 percent (not adjusted for inflation). That doesn’t mean college is cheap. “The reality is that college tuition exceeds mortgage payments for a lot of people. If you’ve got two kids and have college costs, you’re probably not going to feel rich on a $100,000 income,” says Joe Pitzl, managing partner at Pitzl Financial in Arden Hills, Minnesota. Families also face modest increases in the cost of health insurance. The Kaiser Family Foundation, which tracks the costs of health insurance, found in 2014 that average annual premiums for employer-sponsored health coverage increased 3 percent to $16,834. Workers on average paid $4,823 annually toward the cost of coverage. Premiums increased by 26 percent over the past five years, slower than the preceding five years, which saw costs grow 34 percent. “There’s almost a sense of entitlement that we need all of these things. Maybe we do, maybe we don’t, but we’re just at a point in time where we consider them necessities,” says Koos. All of these subscriptions, bills and products can easily add up to more than $5,000 for a family of four. Adam says that technology and those expectations lead to higher consumption and spending for households in all income levels. “It’s a big problem we see as planners. People expect more out of life than they did 20 years ago, and the cost of those things is rising, so it’s a double whammy,” says Adam. Black Panthers Intimidate White Voters? Yes or No on Measure K? WOOF! Counter-revolutionary commentary for our times. "we shall be as a city upon a hill"
Số 7, Lê Văn Thịnh,Bình Trưng Đông,Quận 2,HCM,Việt Nam. An objective exercise in seeking the facts.